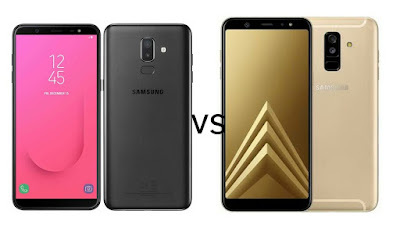 Samsung Galaxy J8 has a Polycarbonate body compared to a Metal body on Galaxy A6+ both have a fingerprint scanner on the Rear. both Phones have Super AMOLED 18.5: 9 Infinity display Galaxy J8 has HD+ resolution whereas A6+ FHD+ both phones are powered by Octa-Core Snapdragon 450 processor with 4GB RAM and 64GB internal storage. On Camera both Phones has a 16MP rear camera with LED flash, f/1.7 aperture, secondary 5MP camera with a f/1.9 aperture, Front camera on Galaxy J8 is 16MP whereas Galaxy A6+ has 24MP front camera packed by a 3500mAh battery.